SALT LAKE CITY — The Utah Jazz will be playing without their floor general for yet another postseason contest. After being upgraded to a questionable status on Saturday afternoon, the team has officially ruled Ricky Rubio out of Game 4 of the Western Conference semifinals today versus the Houston Rockets. Rubio has missed the last four games with a left hamstring strain. Veteran forward Derrick Favors is also listed as questionable with a left ankle sprain. Utah trails the Rockets, 2-1, in the best-of-seven series. Game 4 is set for 6 p.m. today in Vivint Arena. That’s not good news for the Jazz. History says the Houston Rockets are going to win this conference semifinal series. So did the eyeball test in the Rockets’ 113-92 Friday win. Being down 2-1 in a playoff series has usually held dramatic consequences for the Jazz. Throughout their playoff history, they have won 18 series when they went ahead 2-1 and lost just four. But when they fell behind 2-1 in a series, they won six and lost 15. Friday at Vivint Arena, the Jazz got obliterated. It has been a wild run of playoff ups and downs. Their theme this year has been “Take Note.” Good choice. They’ve certainly hit both the high and low tones. In their first round series with Oklahoma City they led by 12 but trailed by 18 in the opening game, and lost. The Jazz won Game 3 by building their lead to 20. In Game 4 the Jazz won after taking a 21-point lead. In Game 5, the Jazz led by 25 but lost. In Game 1 against Houston, the Jazz trailed by 27 in a loss. Game 2 saw the Jazz lead by 19, only to see it evaporate, yet they hung on to win. Momentum swings have been a fact of life in the postseason. Right now they’re a team with its momentum missing. Six Jazz players scored in double digits to push Utah to an impressive win on the road. Dante Exum dribbled baseline and threw a nasty tomahawk down over P.J. Tucker with under a minute left to play. Everyone on the Jazz bench jumped out of their seats to celebrate. If any one of them were in the game, that could have been them, too. 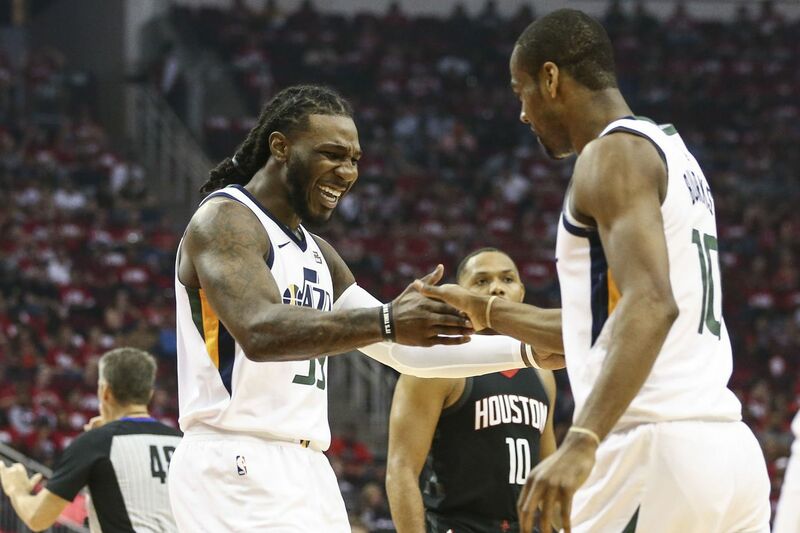 The Utah Jazz built a 19-point lead in the first half, and in half the time it took them to build it, the Houston Rockets blasted right through it. But that didn’t scare the Jazz away from success late in Game 2. Instead, it pushed them toward it. After James Harden scored 17 points in the third quarter along to wash Utah’s lead right away, the Jazz stayed the course and extended their lead back into double digits to finish with a 116-108 victory on Wednesday night. There was no one player who was responsible for Utah’s win. It was a collective effort that powered Utah past the top-seeded Rockets. Maybe Donovan Mitchell, who had a particularly poor shooting night (6-of-21 from the field, 2-of-8 from three), could be responsible for Utah’s success with his 11 assists that got each of his teammates involved. The Jazz outscored the Rockets by 14 in minutes that Mitchell played in. 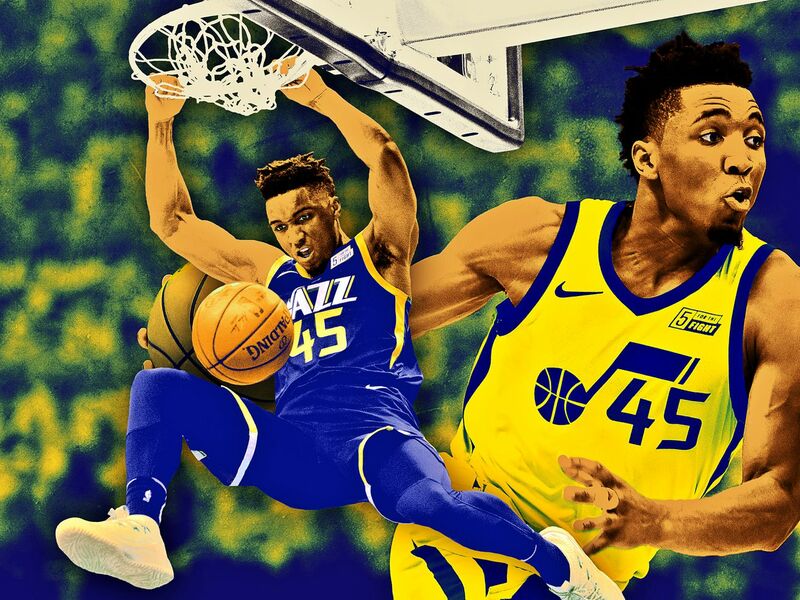 Donovan Mitchell exceeded even the most optimistic projections as a rookie. The no. 13 pick in this year’s draft is coming off a star-making series against the Thunder, in which he averaged 28.5 points a game on 46.2 percent shooting. Part of his success comes from the unusual situation he landed in: a playoff team with a ready-made foundation looking for someone to fill the hole created by Gordon Hayward’s departure in free agency. All Utah needs Mitchell to do is get buckets. His teammates take care of the rest. The next step for the Jazz is figuring out how to build a team around their rookie sensation, a question their second-round series against Houston—which continues with Game 2 on Wednesday—will help answer. Playoff teams rarely give a rookie this much responsibility. First-year players who get minutes for a contender are typically defensive-minded role players like OG Anunoby in Toronto. Even Jayson Tatum had a below-average usage rate (19.4) in Boston before a wave of injuries created a bigger role for him. Mitchell had the third-highest usage rate (29.1) of first-year players who logged at least 2,000 minutes in NBA history. Most of the other seasons near the top of that list came from players in rebuilding situations, like the Mavericks’ Dennis Smith Jr., who had a usage rate of 28.9 on a 28-54 team.